It is 5:30 AM and I am sitting the Phoenix Sky Harbor Airport waiting to board my plane back to Detroit after a great time here in Phoenix with a lot of 0n-fire Catholics at the conference in the Cathedral. It was a packed house with many of them converts, the rest those who have come back to the Church or have had a revival. They were an enthusiastic and fun group. 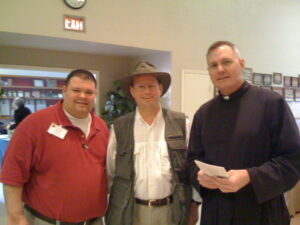 (Picture: Chris Mincolla who organized the event and Fr. Rob Clements of the Phoenix Cathedral who also was the voice of St. Clement in our Apostolic Fathers DVD). I gave my conversion story, my talk on A Virtual Tour of the Life of St. Paul, and a Defense of the Eucharist. We also premiered our new DVD which is the first of a new series I am producing with Joe Reynolds of Skyline Productions (producer of our Footprints of God series). The new series is entitled “Join Steve Ray” with each episode having a subtitle. The first one just released this weekend is Join Steve Ray in Galilee. These DVDs are filmed on location as I lead pilgrimage groups through various biblical land. The viewer joins us as we explore Galilee, join segments of the Mass, hear portions of my on-locations talks, etc. With Galilee finished we are now working on Up to Jerusalem and volume three will be In Jerusalem. We plan to have furture released of Join Steve in Egypt, Jordan, Turkey, Greece, Syria & Lebanon, in Italy and specifically in Rome. Watch my website here as I will be selling the first DVD starting this week. Joe Reynolds and I also met to begin plans for our next Footprints of God DVD which will be filmed in March 2010 (Lord willing). It will be shot in Iraq, Turkey and Israel. It will be entitled Abraham, Father of Faith & Works with an expected release date of September 2010. We have also produced six interview variety shows entitled Defendors of the Faith which will begin airing on various Catholic TV stations in the coming months. We will be shooting more of these interview shows this summer. To learn more about this project visit DefendersOfTheFaith.tv.